"My mom threw this together for a family gathering one year at the last minute, and it is now the single most requested dish at every gathering...family or not! 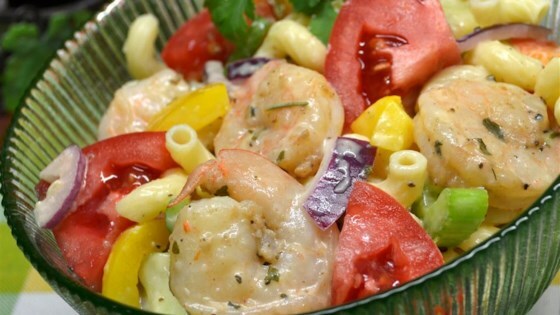 Wonderful shrimp and pasta salad that satisfies the carb crave and is healthier than some of the other options we have these days. Great for backyard barbecue with friends or a quiet dinner inside with family. Serve chilled. Add vinegar for an extra tang! Feel free to add olives, peppers, or whatever veggies you love. This recipe is very flexible and forgiving." Transfer warm macaroni into a large salad bowl and gently mix in celery, onion, cucumber, tomato, shrimp, and Italian salad dressing; refrigerate at least 1 hour (up to overnight for best flavor). Gently fold mayonnaise into salad and serve. If you do not like celery, use celery seed. Add a teaspoon of vinegar and mix to individual servings for an extra zing. This is the first time to make a cold dinner of any kind with shrimp. Without a doubt I will be making it again. I halved the Mayo and salad dressing and added some red pepper. served to guests and loved it.